BMW has super-charged the race towards zero-emission biking by unveiling its latest concept electric motorcycle. 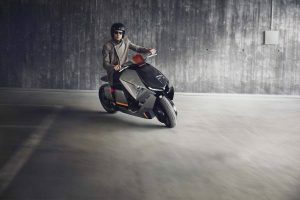 The BMW Motorrad Concept Link uses radical electric battery packs stored in its base, features a reverse gear to make parking easier, and a seat that adjusts itself to suit each rider’s bottom. Its touchscreen dashboard can even be connected to the rider’s online calendar so it always knows where it needs to go every time it is started. BMW claims the concept is “extremely fast” though designers have not yet revealed stats to back up the claim. 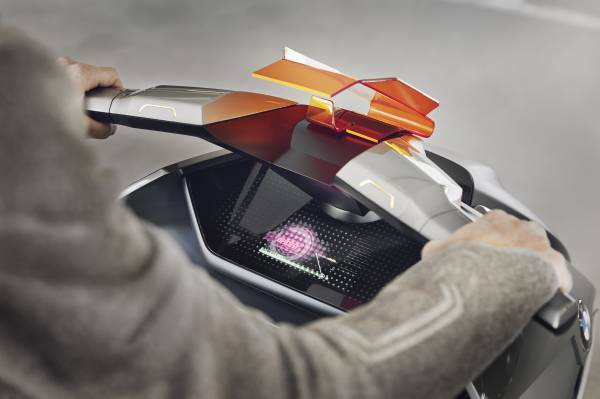 The German automotive superpower hopes the concept could kickstart a new era of motorcycle design. BMW Motorrad’s Alexander Buckan said: “The technical realities of electric drive – such as the flat energy packs in the underfloor and the compact drive on the rear wheel – allowed us to create a highly distinctive design which shapes a new segment. BMW says the concept blends fast acceleration and easy handling. Due to its low overall height, getting on is easy too, from the side or even from the back. A reverse gear ensures that it is easy to manoeuvre, making it ideal to park in tight city spaces. Instead of a classic instrument cluster, speed, navigation and battery information is projected onto the windshield directly in the rider’s field of vision. Secondary information is displayed on a panel below the handlebars. Programmable, touch-enabled buttons on the handlebars allow the rider to access functions without having to loosen grip. The concept is the latest in a series of vehicles designed by BMW to showcase the future of transport. After years of associating the Italian company with aftershave and t-shirts more than with what it knew to do best, Lambretta got resurrected and finally revealed a new neo-retro scooter. World, meet the V-Special – the brand’s first 21st-century scooter. The new Lambretta V-Special should be exactly what you’re looking for if you are a man who likes retro-styled scooters but thinks the Vespa looks more suited for girls. The design, created by world renowned KISKA (KTM and Husqvarna) in collaboration with the Italian Lambretta community is a synthesis of classic design elements with modern interpretation. The masculine machine is issued with the vibrant type names V50, V125, and V200. As the name suggests, the V50 version is powered by a 49.5 cc 4-stroke air-cooled engine that puts out a maximum of 3.5 hp. 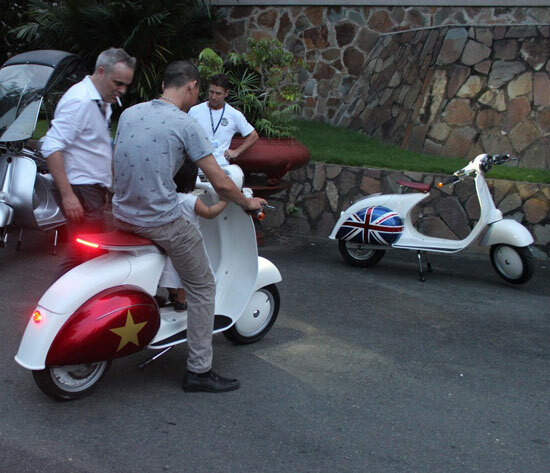 It is Euro4 compliant, has an electric starter and can bring you up to a speed of 45 km/h. Subsequently, the 125 cc puts out 10 hp while the larger 200 cc cranks about 12 hp. All models use a CVT and a belt driven final transmission. Only the V50 comes with a rear drum brake, while the other two are fitted with front and rear disc brakes which are commanded via a combined braking system to be more user-friendly. Other features include LED lights, 12 V charger, glovebox, luggage hook, large luggage compartment under the seat, side and main stand, and an LCD instrument panel with Bluetooth connectivity. One of the features Lambretta introduces is the double layer side panel. It encompasses an ingenious 1.2 mm steel semi-monocoque architecture inspired by the aeronautic industry. The sides are covered with panels that can be delivered in different shapes and colors. And word is the company will also offer an all-electric version next year. It looks like some big investments have been poured into the company as the plans don’t stop here. 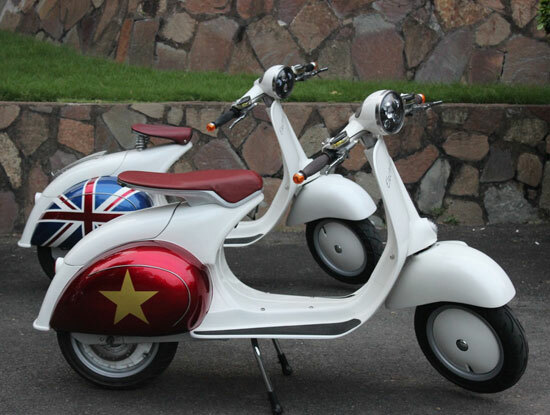 Alongside the contemporary range, Lambretta is working on the re-introduction of its most iconic classics – the GP 200 and the SX 200 in Euro 4 and electric versions. 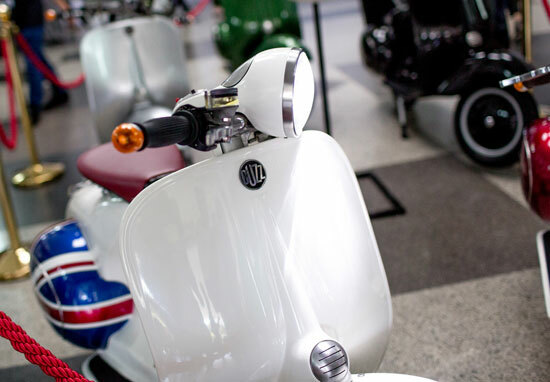 Lambretta is anticipating on the requests of a segment of die-hard Lambrettisti that wish to extend their collection with upgraded versions. 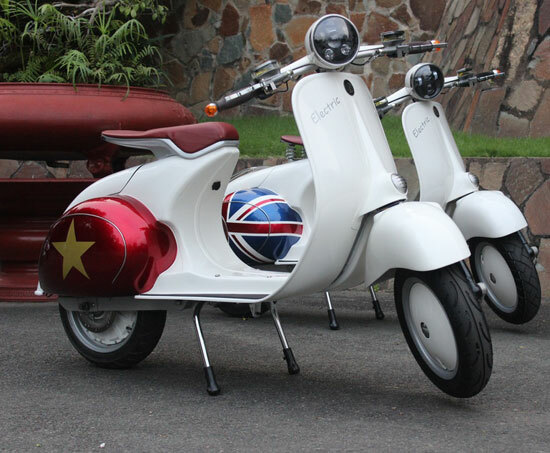 Currently, the global market is flooded with replicas of classic Lambretta’s from China, India, and Thailand. 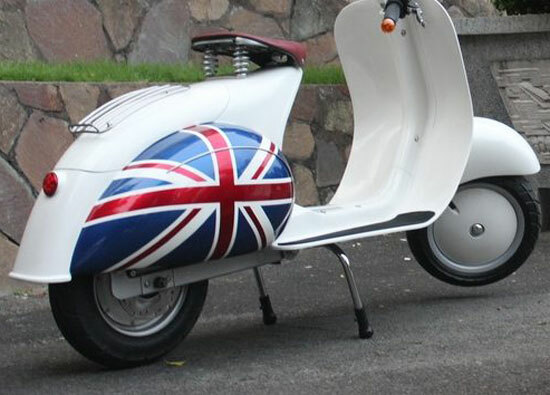 Lugano-based Innocenti SA, the mother company of Lambretta has recently announced that it will take a strict stance on all copycats and their distributors avoiding free riding on the repute of Lambretta. 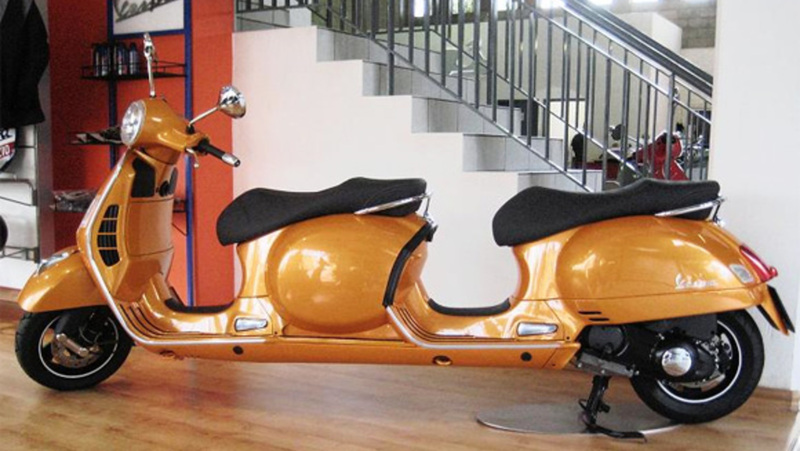 Vespa is an Italian manufacturing icon and symbol of the Italian renaissance after the second world war. This scooter became famous worldwide thanks to the movie ‘Roman Holiday’, a romantic comedy directed by William Wyler in 1953 where Gregory Peck and Audrey Hepburn did a little sightseeing around Rome on a Vespa 125 low light. The far-fetched story between an American reporter and a young princess eclipsed the sporting image of the Vespa built some years earlier and some 375 miles away from Rome, where Piaggio’s scooters were under the spotlight due to an unexpected international motorsport triumph. The 26th edition of the ISDT was held 18th – 23rd September in Varese, Northern Italy. Usually referred as a sort of Olympics of Motorcycling, with trophies for best six-rider national, four-rider junior national, three-rider women’s national, three-rider club national and three-rider manufacturing teams. This competition mixed off-road and on-road routes and a track session at the Monza circuit. The race was won by the UK team (Rist, Viney, Alves, Stocker and Ray) although the most unexpected result came from the Piaggio Squadra Corse. In fact, rather amazingly, their tiny Vespa 125, specially prepared with a larger Dell’Orto SS23P carburettor, high performance exhaust and two petrol tanks was able to win 9 individual gold medals. They also earned Piaggio the Industry Gold Medal, as the only Italian team to win the trial. After this unexpected triumph, the Piaggio’s were produced in a limited edition, only around 300 units, obviously destined for the regularity competitions sold at four time the price of standard Vespa 125. Luckily the new Sei Giorni isn’t so pricey: £5399. The ‘Sei Giorni’ isn’t a new model but a clever refurbishment of the GTS 300 launched in 2006 for the 60th anniversary of the Vespa. Some of its styling details such as low headlight, chrome handlebar and the small dashboard with a white background remind us of its ancestry. Coated in a charming and almost military-style matt green which contrasts nicely with the all-black rims wheels and silencer, the Vespa Sei Giorni show off its sporty spirit with the burnished windshield, black number plate and one-piece saddle which is lavishly made in dual leather and piping with white stitching. 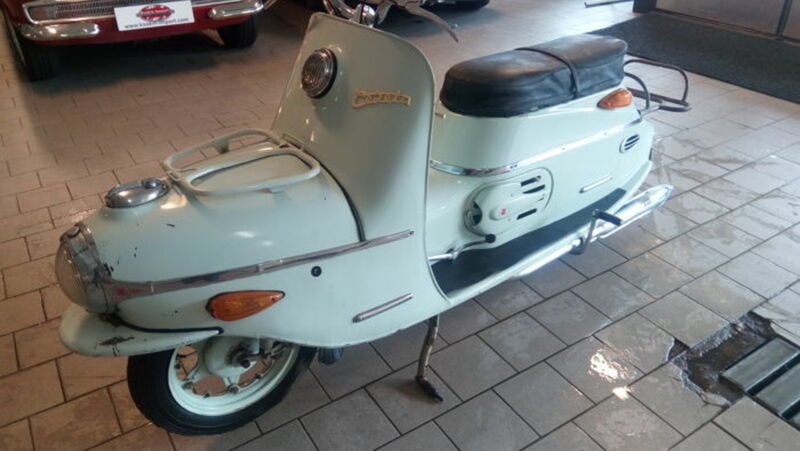 As every respectable special edition, the Vespa Sei Giorni has its identity shown on the metal plate with the serial number struck on the leg shield. Despite its racy look, the Vespa Sei Giorni pampers its owner with some attentive details such as a wide helmet compartment, USB port and the storage compartment in the leg shield back plate maybe not really in racing style soul but certainly useful. The press launch of the new Vespa Sei Giorni was held in Varese, on the same roads where 66 years earlier, the 125 won 9 gold medals. Even though it was a long time ago, Varese hasn’t changed too much. There are always mazes of narrow and steep roads that link the lake to the highest part of the city, named Campo dei Fiori. In short, it means that you can reach the highest point starting from the lake in 15 km and with 1000 metres of difference in altitude. Seated on the Sei Giorni I was impressed with its eye-catching finishing. Seat, grip, dashboard, handlebar switches, paint, everything looks really attractive. Turn on the engine, I am surprised how unintimidating it is, maybe too much for a single seat scooter with black number plate. Although its single cylinder 4-stroke, 4- valve, liquid cooled it has lost 1hp after the Euro-4 treatment, it is still capable of putting out 21.2 HP at 7750 rpm with the respectable hit of torque of 22 Nm at just 5000 rpm. On the open road, the Vespa gets quickly from 0 to 45mph. The game’s over when the speedometer shows 75mph but the impression is that it could be faster with a different final ratio. However, maximum speed isn’t important stuff, especially for a scooter. The Sei Giorni is incredible fast whether you dash around the snaking roads or on every kind of paved surface thank to an impressive suspension setup. Riding this Vespa along the old trial stage of the Six Day race, from Palace Hotel to Sacro Monte, I was surprised by the suspension response, it’s able to absorb the potholes and large cracks founds on this mountain road. If you are riding with a little more vigour, the noise of centre stand is scraping the tarmac reminds you that we aren’t in 1951 and your licence driving is in danger. For this reason, I cannot say that it’s a defect of the new Sei Giorni but simply a warning message. On the contrary though, I have no doubt that a responsive brake is needed. I’m also unconvinced about the dashboard readability. It looks lovely but like its ancestry is too small for the view of a middle-aged man like me. Could the 2017 Vespa Sei Giorni win the Six Days Trial today? This is the question that I had in mind while riding this Vespa along the Varese route. Left, right, left, downhill, brake, u-turn, I keep an eye on my rear view mirror and I can see my photographer getting smaller and smaller. He’s riding a T-Max and he’s really in trouble trying to follow me on these narrow and crazy roads despite his Yamaha having double the amount of power and I am not at all a fast rider. He uses the power to his advantage and reduces the gap only on the straights. The Vespa boasts perfect balance and you can focus on the next turn confident that it will digest the change of direction and any obstacle with ease. I turn off the engine and we are safe back at the hotel and I reflect, thinking that if the Vespa Sei Giorni could win again, then the next Six Days will have to be held in maze-like location like Varese. Sometimes you come across a vehicle, whether on the road or online, that blows your mind. Over the past century you can see the creativity of scooter designers increasing as new models are produced, each more wonderful than the one. 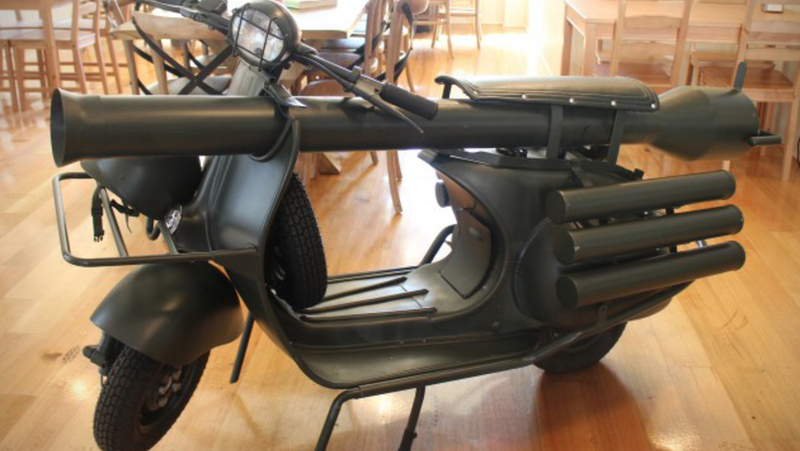 So, take a look at these 10 unusual scooters and wonder how anybody came up with such creative designs! 10. Cezeta 501The Type 501 scooter is Cezeta’s first scooter, with a unique design that was very popular among youngsters: the long seat is perfect to carry two persons. 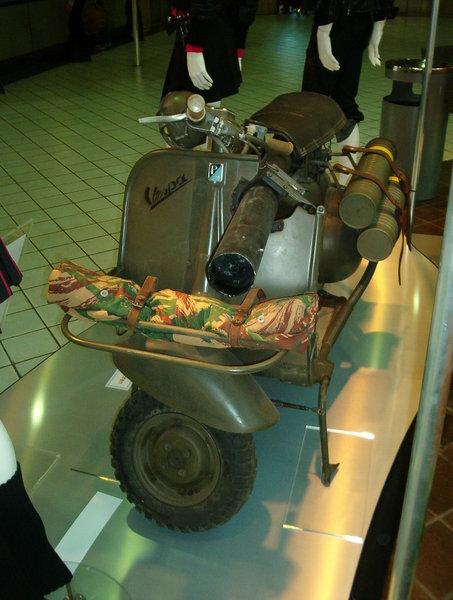 At 2 metres the “torpedo-like” scooter is much longer than regular scooters in those days, holding a pretty large luggage compartment since the fuel tank is located above the front wheel. 9. Salsbury Motor Glide de LuxeThe Salsbury scooter brand brought the first generation of scooters to America. This 1938 Motor Glide de Luxe was featured with an automatic instead of a manual transmission. 8. Mitsubishi Silver Pigeon C-10After World War ΙΙ, scooters were used to help reconstruct Japan – they were so important to the country that a Silver Pigeon was presented to the Emperor of Japan in 1948. This Mitsubishi Silver Pigeon C-10 from 1946 was the first in a long line of successful scooters. 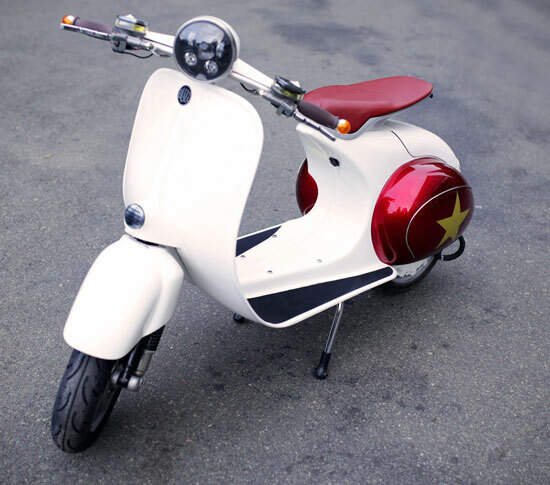 The design was based on a scooter brought from the United States by a General Motors engineer. 7. Honda Juno KThe 1954 Juno K was not only the first Honda scooter but also the first in a number of other areas as well. It featured the first electric start, the first fibre-reinforced plastic body construction, first turn-signal lights and a full windscreen with a tilt-back sun-shade. Sounds pretty cool, right? Well, former Honda vice-president Kihachiro Kawashima says the bike was a ‘splendid failure’. Too expensive, too heavy and the engine got too hot too soon. Still, it’s quite an awesome collector’s item now! 6. KYBELE Cyber scooterThis scooter looks like something from the future; like it belongs in a city with flying cars and robots. 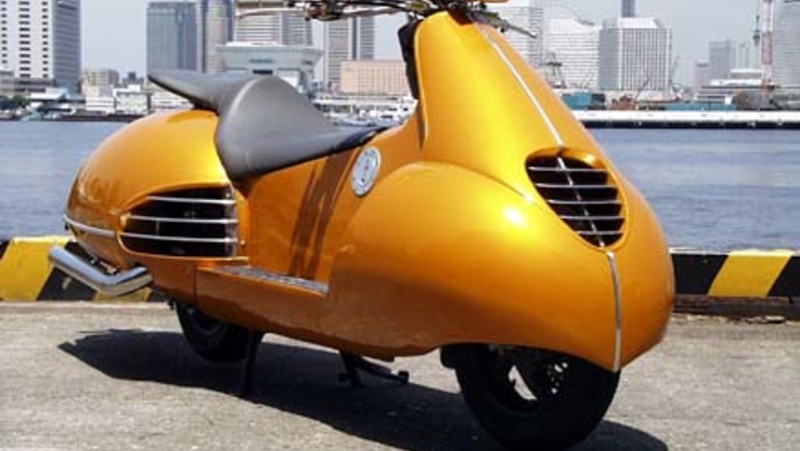 The KYBELE Cyber scooter actually started off as a Honda Fusion, customised into this futuristic vehicle by the Japanese firm Gull Craft. 5. Vespa Stretch ScooterThe family-version of the scooter: with 4 seats it is supposedly ideal to drive your kids around. Vespa South Africa subtly refers limousines, by calling it a stretch scooter. A pretty creative vehicle, but how sturdy is it? 4. 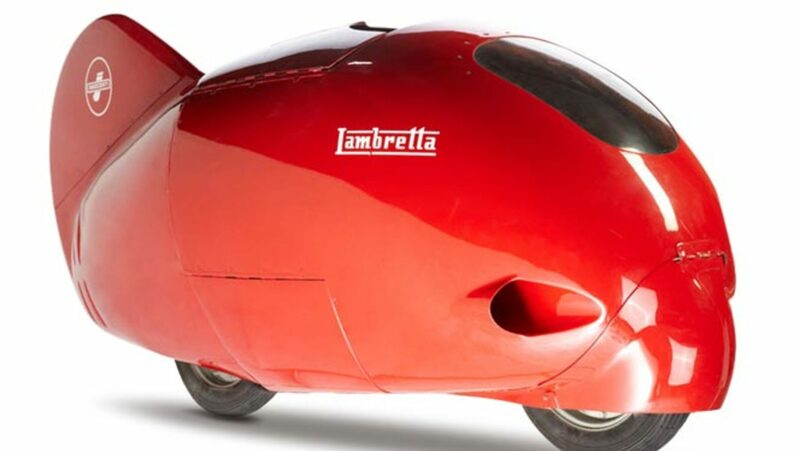 Lambretta RecordThis little red devil broke the world record of speed in the scooter category back in 1951, going an astonishing 201 km/h on ‘the flying kilometre’. The ‘red bullet’ is indeed as fast as it looks! The record was set by Romolo Ferri when he beat the Vespa Torpedo, his greatest competition at the time. 3. Piaggio Ape Calessino 1953A scooter and a covered wagon all in one. 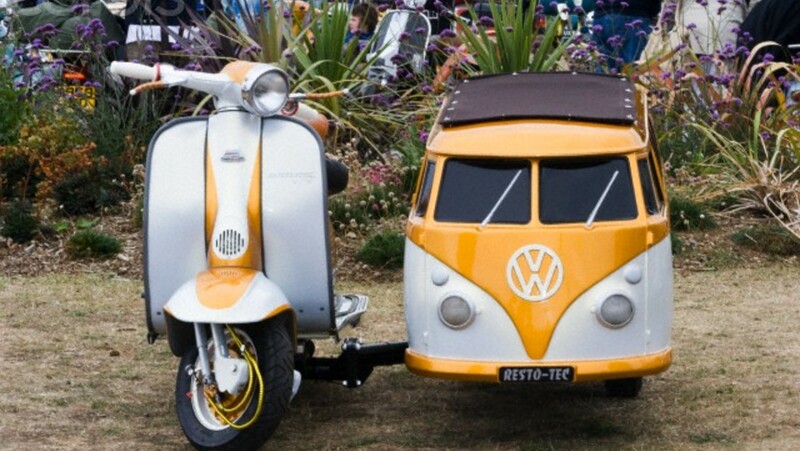 This vehicle really takes you back to ‘La Dolce Vita’ of the 1960s! While the driver takes you around Rome or Toscana, you and your lover can sit back and enjoy the ride. 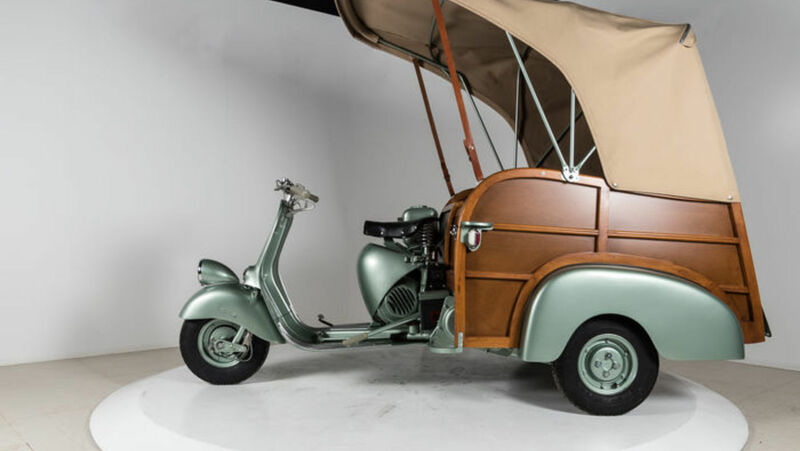 This classic scooter is still very valuable as a 2016 Catawiki auction shows: a Piaggio Ape Calissino 150cc from 1953, perfectly restored, was sold for £20,622. 2. Lambretta TV 175 with Volkswagen Bus SidecarThis is definitely one of the cutest and coolest scooter sidecars on the planet. Not quite suitable for camping however. 1. Vespa 150 TAP with canonOnce you have seen this scooter, you have seen it all; it doesn’t get much more creative than this! 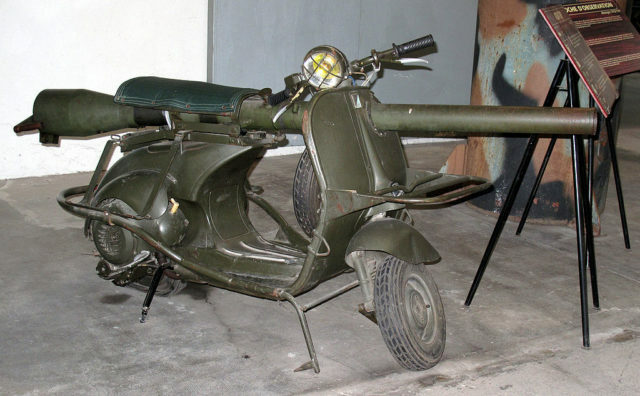 The ‘Bazooka Vespa’, introduced in 1956, has a rifle mounted to it and only about 500 of these scooters were ever made. They were parachuted into war zones and hidden in hay-bales. 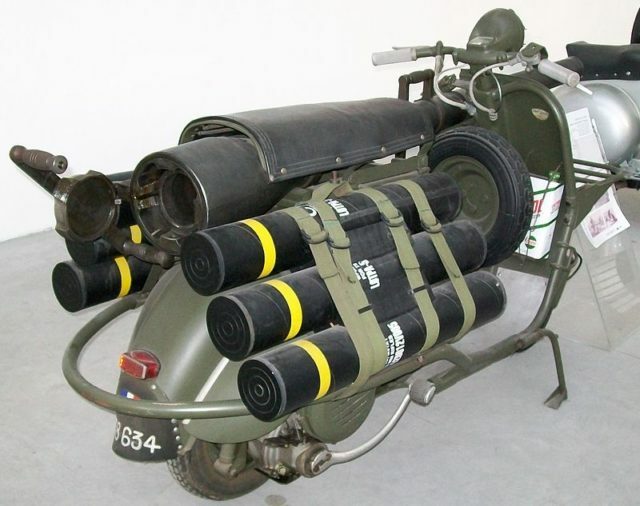 With a top speed of 40 mph these scooters were faster and more mobile than most vehicles on the battlefield. 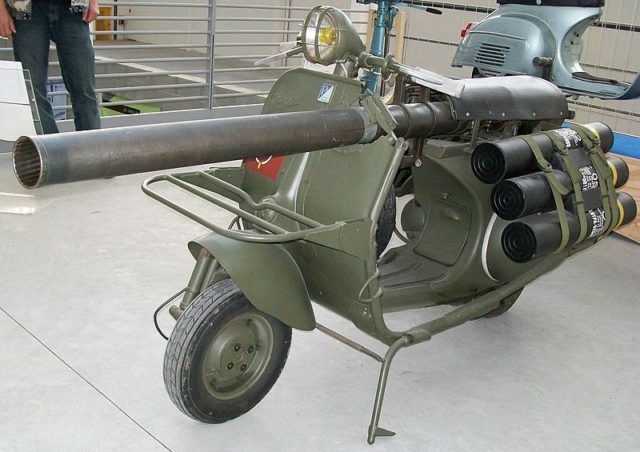 Enrico was not satisfied with the looks of the scooter, so he asked the aeronautical engineer, Corradino D’Ascanio, for a redesign. In 1946, the MP6 model was created, and when presented to Enrico, it was immediately called “Vespa” by the owner himself. 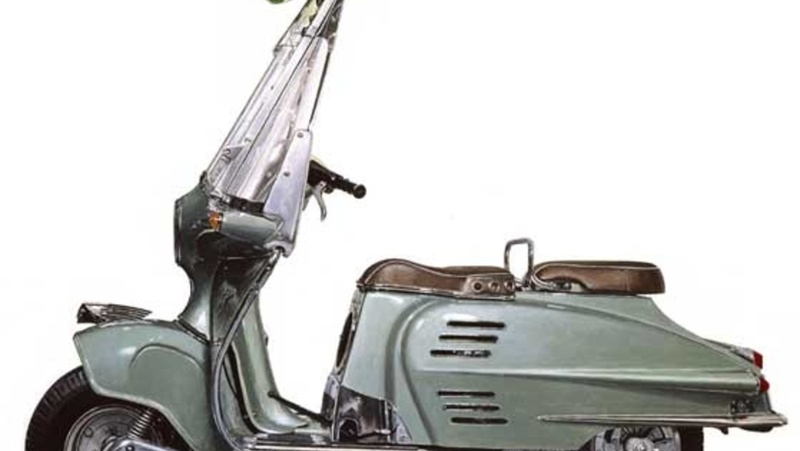 The Italian term “Vespa” means “wasp,” and its name was given due to the looks and the sound of the vehicle. 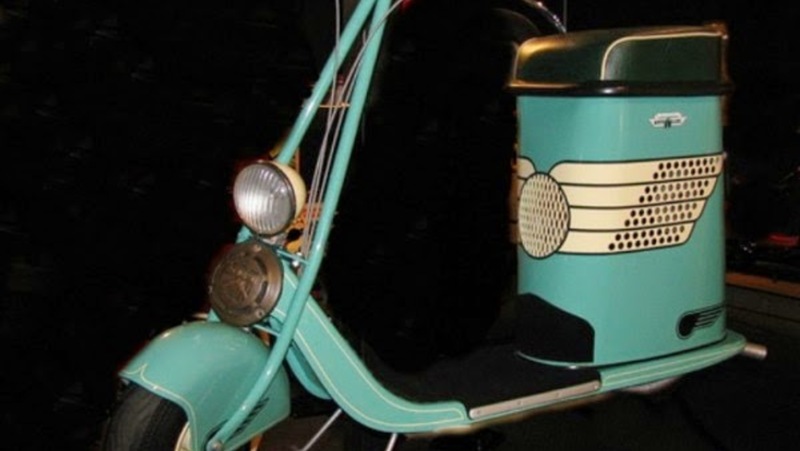 On 23rd April 1946, the scooter was patented in the Central Patents Office in Florence, and the production began. The Vespa was an instant success, and it became famous soon after the launch. 13 years since the creation of the Vespa, there were one million scooters sold. Today, this number has increased to over 16 million. 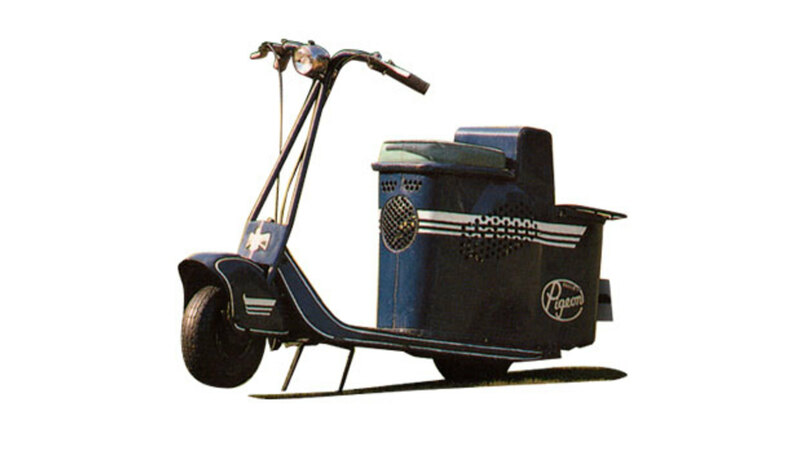 Many other manufacturers tried to copy the Vespa and produce their scooters, but none of them had the beauty and durability of the Italian scooter.